Automotive seat belt buckles listed as individual components or in sets including an adjustable or non adjustable latch. Push button buckles are available with matched to the webbing color with a black or red press area background with white "PRESS", color matched with a globe design on the press area and with a starburst design or a GM logo on the press area. 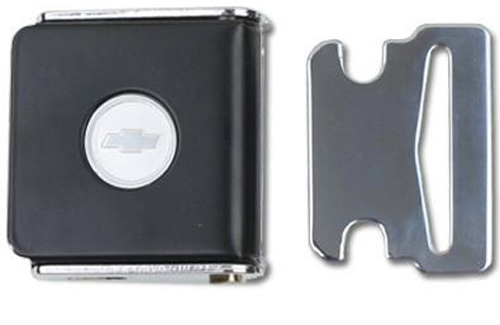 vintage lift latch buckles include with a bright chrome lid, with a black hammertone wrinkled lid, with a satin finished lid and with a resessed Chevrolet Bowtie color matched to the webbing lid. 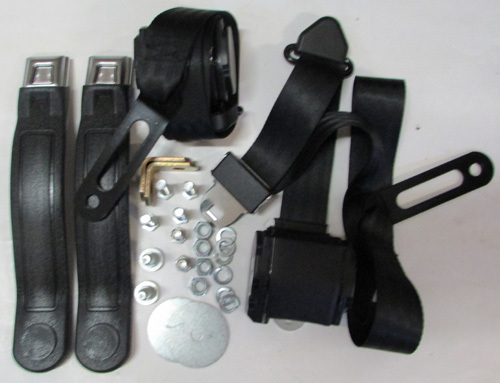 Individual seat belt buckle components include buckles only, adjustable webbing length latches and non adjustable webbing length latches and replacement buckle covers. Special Note: When a buckle or latch is purchased as a individual component and not as a matched set there is no guarantee that the purchased component will fit an existing component. All of the buckles and componets listed are not implied to original or an exact reproduction unless specifically indicated under the product notes. Buckles with a colored cover or lift latch lid and colored latch covers are not guaranteed to match an existing interior component, webbing or seat belt. Includes chrome latch with rectangular center cut-out. Buckle measures aproximately 2 3/8" x 2 3/8". See end of section for individual components. Click Here to view samples of available Webbing colors. Buckle sets include chrome latch. Buckles measure approximately 2 3/8" x 2 1/8" with a 1/4" lid lip. Buckle has black hammertone(wrinkled) lid. Chrome latch included. Buckle measures approximately 2 3/8" x 2 1/8" with 1/4" lid lip. Powder coated colored lid with recessed Chevrolet Bowtie insert. Includes chrome latch. Buckles measures approximately 2 3/8" x 2 1/8" with 1/4" lid lip. A color match to existing seat belt or interior component is not guaranteed. When purchasing a latch only no guarantee is made as to fit in to an existing buckle. 8228 latch is chrome with a rectangular center cut out. 8374 latch is for use with vintage lift latch buckles. Buckle is plastic capped with a metal underside measuring approximately 1 3/4" x 2 3/8". 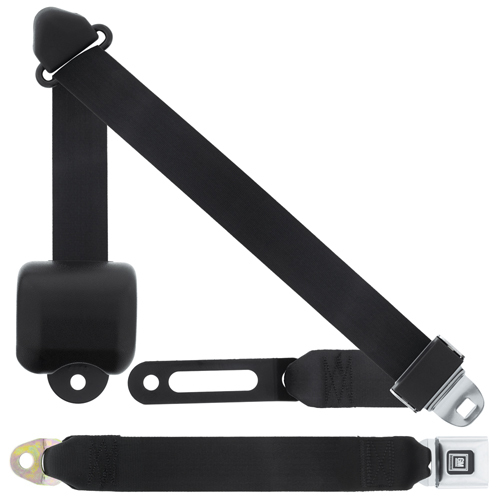 Set includes adjustable webbing length latch with a black cover. Set includes chrome adjustable webbing length latch with black cover. Contact Us for the availability of buckles only and colors not listed. Buckle is plastic capped with metal underside measuring approximately 1 3/4" x 2 3/8". 8378B latch only allows for webbing length adjustability. Includes black cover. Buckle is plastic capped with metal underside measuring 1 3/4" x 2 3/8". When purchasing a latch only it is not guaranteed to fit an existing component. Buckle is all metal measuring approximately 1 3/4" x 1 3/4". Select buckle and latch for a complete set. Select 8379 latch for fixed webbing length. Select 8388 latch when webbing length adjustability is required. When purchasing a buckle or latch only it is not guaranteed to fit an existing component. 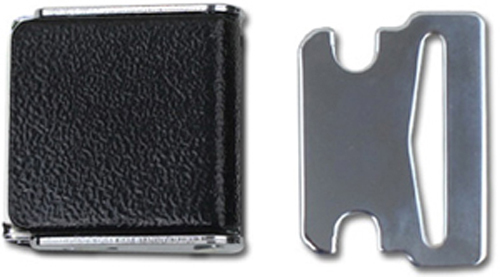 Buckle measures approximately 2 1/2" W x 2 5/8" L.
Set includes chrome fix webbing length latch. Press area has recessed silver framed GM plus Mark Of Excellence on blue background. Top is black. Can be painted to match interior. Select 8379 tongue for fixed webbing length. Select 8388 series tongue when webbing length adjustability is required. Set includes adjustable webbing length tongue. Buckle is end release with embossed red press measuring approximately 2" W x 2 7/8" L Contact Us for the availability of colors not listed. Includes GM Mark Of Excellence(blue) push button, cover(no base), button release spring and bar. Available in black, blue, grey and red. Color is not guaranteed to match an existing seat belt buckle or interior component.